As my students at SF State and within the SF Unified School District go back to school this coming week, many displaced students and their families in the Gulf Coast area still are in limbo as New Orleans struggles to rebuild. I have found many of the resources below helpful in teaching about what New Orleans means for our ongoing struggles for educational and social justice in America. Great Resources for Teaching About New Orleans and Katrina - Rethinking Schools - An Unnatural Disaster: What will Teachers Do? Rethinking New Orleans Schools By Jordan Flaherty, WireTap. 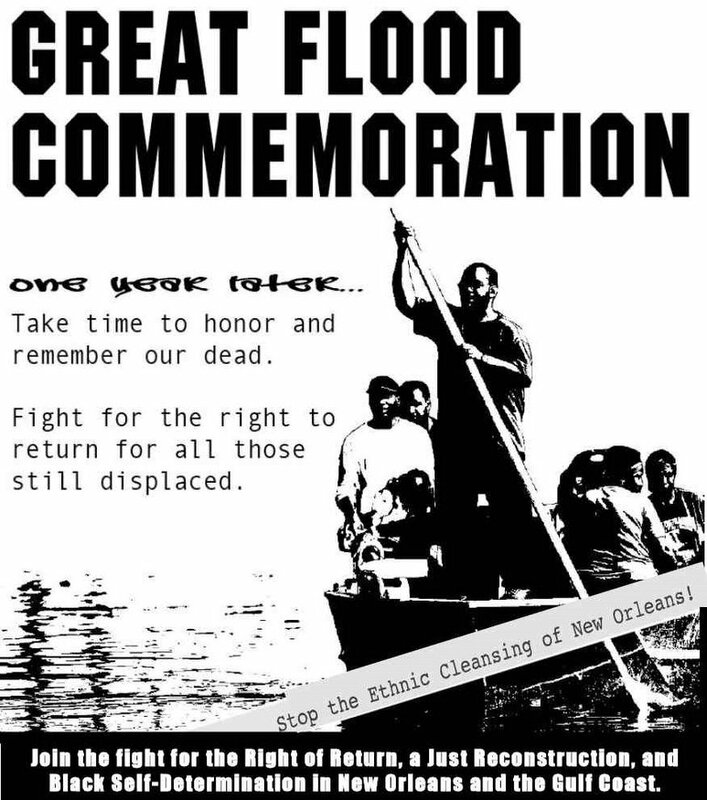 Fight for the Right to Return, a Just Reconstruction, and Black Self-Determination in New Orleans and the Gulf Coast! 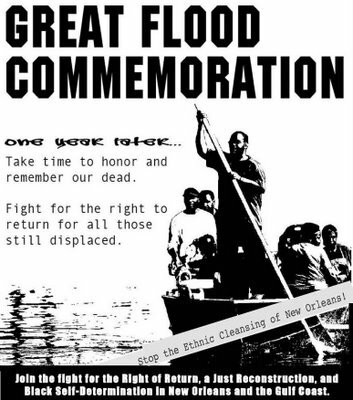 Organized by Survivors for Survivors and the Bay Area Katrina Solidarity Committee. Also, Watch Spike Lee's new HBO 4 part documentary WHEN THE LEVEES BROKE: A REQUIEM IN FOUR ACTS. Mann spoke with Kali Akuno of the Malcolm X Grassroots Movement and others to a packed auditorium of activists and revolutionaries in SF's Mission District earlier this month. Mann and Akuno urged stepped up solidarity and support for New Orleans and Gulf Coast people. ColorLines Magazine also features an excellent piece by Jordan Flaherty with great examples of people organizing for a new day despite tremendous oppression and repression. As millions of Mexican people continue their protests of the recent fraud and undemocratic practices that denied PRD leader Andres Manuel Lopez Obrador the Presidency, Oaxacan teachers are continuing their Fight for Democracy in Mexico despite brutal repression by the state. Filmmaker Jill Freedberg reports in her blog that the teacher's strike which has evolved into a popular movement calling for the resignation of governor Ulises Ruiz Ortiz is now deteriorating rapidly. She says, "International solidarity is critical now. The world needs to send a strong message to the state government in Oaxaca that state violence against a peaceful movement is unacceptable." The resolves in this resolution include the condemnation of the state police for attacking our striking brothers and sisters as well as the condemnation of the use of state violence to break a teachers union. It also expresses support for the demands of Local 22 of the SNTE (Teachers Union) for fair salaries and funds for adequate buildings and supplies. The last part of the resolution asks that the AFT Executive Council considers contributing funds to replace the teacher's radio equipment which was destroyed by the police. "I received your message and wanted to write that the situation within the teacher's union is really difficult. We are living a terrible repression under Ulises Ruiz Ortiz's government. Today at 12:30 a.m. a concerted attack was launched against the teachers who were guarding the radio stations. 40 pickups full of police leveled their guns at our companions and fired without regard for who might be wounded or killed. During the attack one teacher (male) was killed and another (woman) wounded. "We are placing guards at each of our camps and in reality we are armed only with our conscience, reason and right. We ask anyone who can help us to please let others know about the situation we are living by any means at their disposal. "The daily reality that we live through in Oaxaca should be told, despite the media curtain that makes it difficult for even other Oaxacans to know the truth. "I would like it if [the university where I study] would raise its voice and let the world know about the situation, I would hope that their understanding of social problems would press them to help us, but it seems that the one-time leaders of social struggle have lost their voice." Teacher: "In truth after last night we are afraid even though we don't say so. No one wants to be exposed but we are aware that we have to go forward until this is finished. The consensus without a doubt was that we go together to the end. We are all saddened by the attitude of Governor Ulises Ruiz Ortiz. Our leaders wanted us to participate in the strike in a limited, representative fashion in order to keep us safe, but we voted to strike as a group, to keep together. At this time there are very few around us who remain quiet and indifferent and we are aware of this. I can assure you that most have consciousness and awareness of what is happening. With respect to our personal security no-one, absolutely no-one is safe in the camps, but after our consensus decision I can assure you that we will continue to the end." Full Gilber article on Znet. A few SEIU friends and other labor leaders from SF and other parts of the US and Canada have just returned from a US Labor delegation to China which included many intense meetings with the All-China Federation of Trade Unions (ACFTU) and the historic building of labor solidarity and new global relationships with the world's largest union. SF Progressive Organizing Center kickoff - 8/30 6pm - 4760 Mission St.
Wednesday, August 30th, 6 - 9 p.m.
We will have some starters; please bring your favorite things to share including munchies, non-alcoholic drinks, finger foods, ethnic delicacies. Please call Vicki for a list of other things needed for our office warming – 415/290-0722. California Star Test Results and NAEP ? Good news. The State Schools supt. Reports that school test scores have improved. Glendale/San Francisco — State Superintendent of Public Instruction Jack O'Connell today released results of the 2006 Standardized Testing and Reporting (STAR) Program that show California students remain on a steady trajectory of improved student achievement. Forty-two percent of students statewide scored at the proficient or advanced level in English-language arts, an increase of 2 percentage points over last year, and 40 percent of students scored at the proficient or advanced level in mathematics, an increase of 2 percentage points over last year. Since 2003 when all state tests were completely aligned to state standards for the first time, the number of California students who scored proficient and above in English-language arts has grown by 7 percentage points, and the number of students who scored proficient or above in mathematics grew by 5 percentage points. "I am extremely pleased that these results show that California’s public school students continue to make steady gains in nearly every subject and grade level," O’Connell said. "Since our state adopted rigorous standards for what every student should learn in every grade, and began systematically integrating those standards into classroom materials and instruction, student achievement has continued to improve. "While movement from year to year is certainly worth noting and analyzing, the real test of sustainable academic achievement is steady gains over multiple years. At this point in California’s transition to a standards-based assessment system, it is worth stopping and taking note of our struggles and success. It is now clear that after almost 10 years of standards based reform, including four years of complete alignment between our standards and our tests, education in California is clearly making meaningful, sustained improvement. There is no doubt we still have a lot of work to do, and no one should be satisfied with our current position, but reforming an entire education system is slow, difficult work. Yet thanks to the hard work of our students, teachers, and administrators, more students than ever before are being prepared with skills and knowledge essential to their future success in our competitive global economy. This improvement deserves recognition and celebration." Noteworthy gains were made this year in many areas, including mathematics, where 23 percent of students statewide scored at the proficient and advanced level in Algebra 1, an increase of 4 percentage points over last year. In addition, 25,714 more students took Algebra I in 2006 than in 2005. Second through fourth graders also made steady gains in math with scores ranging from 54 to 59 percent at proficient and above. The greatest gains in English-language arts came in grade two, where 47 percent of students scored at the proficient and advanced levels, and in grade three, where 36 percent scored at that level – marking a 5 percentage points increase over last year for each grade. Each ethnic and socioeconomic subgroup of students has also shown steady improvement over the four years since the tests became standards-aligned. However, the achievement gap persists between African American students, Latino students, or socio-economically disadvantaged students and their white or Asian peers. "I remain deeply concerned that the achievement gap continues to be unacceptably wide," O’Connell said. "The academic achievement of our Latino, African American, and socio-economically disadvantaged students lags far behind the rest of their peers. We are working to address this problem by providing struggling schools extra resources and additional interventions, and with better training for teachers. But clearly, we must work harder, faster, and with more focus to narrow this gap and to permanently close it. This will be my top priority as I start my second term as Superintendent." The above is certainly good news. However, we must ask, if state scores are improving, why are not the scores improving signigicantly on the national test, the NAEP? On the state STAR tests, closely tied to the state standards and the state textbooks, students are making modest progress. However, if the question is, Do students read better? Or do they know math better? If students read better, they should achieve at a higher rate on any respectable reading test- not only the test that precisely matches the words selected on the test. Here NAEP scores are important. There has been no significant change in California reading and math scores on the NAEP. 18 of 19 members signed the proposal. My interest in the article focused on who got to set the agenda for the panel and who got to sit on the panel. Spellings gave the panel its goals which were to examine access, affordability and accountability to determine whether higher education was TURNING OUT students qualified to compete in the global economy. Appointed to the commission were corporate business executives (IBM, Boeing, Microsoft etc) and representatives from higher education, themselves having close connections to corporate business executives. notice how the GOALS and the MEMBERSHIP of the commission are closely related. The LAST sentence of the article (and I was surprised to see this mentioned at all) was: "several groups said the report spent much ink discussing increases in students' work skills, while slighting the mission of colleges and universities to educate students as CITIZENS." mmmmm, citizenship skills, knowledge and dispositions....what's that??? just watching a debate, some TV ads and voting once a year, right? The description of policy development and implementation that this article desribes is exactly the same as what happened to the transformation of k-12 education during the last 15 years. Notice that there are no representatives of labor unions (teachers, carpenters, lawyers, doctors, nurses, janitors, etc) or churches on education panels such as this federal one, panels that create the broad outlines of where our educational system is going and what it should be about. Notice how even the inclusion of the university establishment is upsetting to a corporate investor who chaired the committee, Charles miller. He "seemed upset by what he characterized as wrangling with representatives of the status quo." He said it was ridiculuous to have to "get into all these battles." Yes, fascism is so much cleaner a decision making process. What is scary to me is that, while rich business leaders have ALWAYS ruled, they are, today, impatient with even having to APPEAR to go through a democratic decision making process. hopefully such arrogance is coming before a fall. To those who want to have schools that include the goals of teaching participatory democratic citizenship, you need to learn how to build a social movement. Lesson number one might be: a march is not a movement. I have always liked Ray Cortines. As Superintendent of San Francisco Schools in the 80's his open door policies, firm handshakes, warm smile and uncanny ability to find the common ground between competing interest groups were refreshing. More recently he has also been very helpful to me while I served as the President of the San Francisco Board of Education and over the past couple of years advising me about labor conflicts, superintendent searches [including how to deal with difficult personalities], and meaningful outreach to business and community groups. And, he's going to need all those skills to heal the rift in LA now. But it seems to me, no one is better equipped than Ray to help put humpty dumpty back together again as top education advisor to LA Mayor Villaraigosa. ...Ramon C. Cortines is back, starting today, in a different role, as the top education advisor to Mayor Antonio Villaraigosa. And once again, the fit, self-assured 74-year-old educator is striding into conflict, this time over Villaraigosa's bid for substantial authority over L.A.'s public schools. Cortines' current message is about rhetorical disarmament and an agenda far more ambitious than books and bathrooms. "It is important that a working dialogue is created between the school district and the unions and the mayor's office" — regardless of whether the mayor gets new powers, Cortines said in an interview Monday. In other words, Villaraigosa may choose to bash the school district as a failing institution — especially if that's what's needed to win the political battle over control — but Cortines will play the role of good cop. That includes a meeting today with schools Supt. Roy Romer, who has chastised the mayor for saying the district is failing. Cortines' approach is a model of consistency. In 2000, he also played peacemaker, refusing to become interim superintendent without the OK of outgoing Supt. Ruben Zacarias, who had just been dumped by a slim school board majority. Cortines also set to work immediately on knitting together a fractious school board.